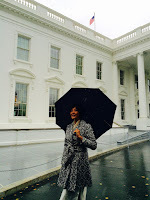 At the gates of the White House, rain fell steadily as we waited to get through security. Our tour of the East Wing would begin at 10:30 that morning. We had been instructed to bring no more than a wallet, a cellphone and if we were to carry an umbrella, let it be blunt and compact, let it be harmless. We were not to carry bags or purses or cameras with removable lenses. We were warned that such items on our person would prohibit us from entering. The Filipino American Heritage Month invitees were scattered among other groups waiting to get in. Umbrellas popped bright colors all the way up to the guardhouse. Some of the manongs and manangs, elders of our community, stood in line, leaning on walking canes or seated in wheel chairs. 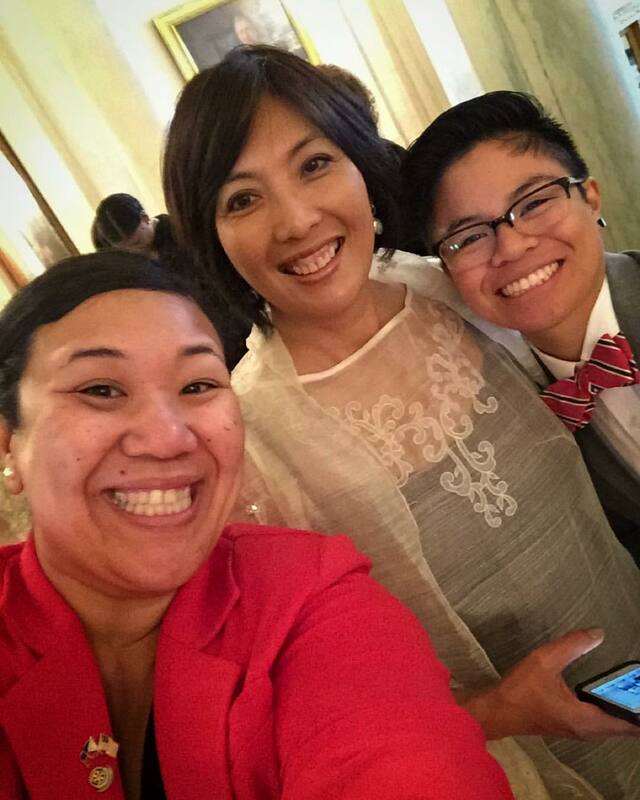 It seemed that while we recognized one another as Pinoy, not many people knew one another. In front of me, two old titas and a young woman dressed in a beautiful blue suit and a red and white bow tie huddled under one umbrella. One tita held onto the young woman’s arm. After 15 minutes or so, we started to see people being turned away or being sent to a little tent for shelter. A Filipina rejected at the checkpoint walked away from the line, shouting,“You can’t bring these in! They turned me away!” She held up a ziplock back of meds. Another woman with a big purse full of make up and extra hankies and what-not did not bother to zip the bag back up. She just turned and left the line. The women in front of me got all the way to security. The younger woman gave the umbrella to the titas as a guard came over and escorted them to the tent. “Was that a special tent for elders?” I asked. I looked at the shoulders of her jacket, how they were dark with rain. “So you left them there?” I asked. The young woman’s name was Via and we made friends in a hurry. 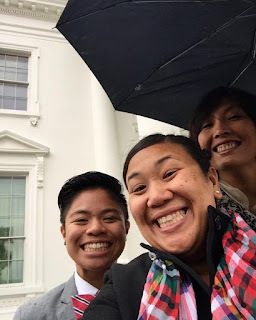 Inside the White House, the photo ban had been lifted and we were given free reign to take selfies and photos, and group shots and shots of shots. Gorgeous frames held groupings of historical photos—first families, first ladies, first pets. Via and I took turns, standing before the China room or Red, Green or Blue Room, and we took photos of one another. I was in my long barong dress and she in her blue wool suit. We looked like we were going to a wedding. In this way, Via and I met Mo on the Go. Via was from New York, and Mo from the Bay Area, and I was from Miami. The three of us looked like characters from the Wizard of Oz, on the road to catch a glimpse of President O, if he would allow it. All day long, we kept an eye on each other, as we continued our tour of the East Wing and then leaving that grand White House, finding our way to the KAYA town hall meeting for Filipino Americans and then to the reception back at the Eisenhower Executive Office Building. Every time we left the White House, we went through security and every time we returned, we stood single file, waiting to get in. We were sisters looking out for each other, meeting other brothers and sisters on the way, making mano to lolas and lolos, seeing old comadres and compadres along the way, folks we’ve organized with, people who have modeled the life of leadership, who supported each of us in various times of our careers. We were all there, standing in line at the White House, umbrellas raised, wet from heaven’s rain and full of wonder. Kababayan to the core.